Prime Minister Rami Hamdallah announced yesterday his decision to dissolve the Supreme (joint) Security Committee, which has been the main demand of the Civil Society Organizations (CSOs), activists, and those concerned with human rights and the rule of law. The Committee was established in the years of 2012 and 2014, assigned with a specific mission to defy differences of a security nature and confront armed persons. In 2016, the Committee was re-established in a way that is different than the previous one, and with a different purpose. The committee became an embodiment of the security-based approach in solving authority problems, and the scope of issues addressed by the Committee expanded so much that it started including the freedom of expression and countering political opposition. The powers granted to the Committee extended as well to include all segments of the society. Accordingly, it is fair to say that the Committee was granted authorities which override those of the Police and the Public Prosecution, as if it became a State within a State. Not only did the Committee’s procedures deviate from the Penal Procedures Law, the Basic Law, and the international convention Palestine is bound by, but they also turned a blind eye to judicial rulings, considering the Committee a reference beyond the powers of the Public Prosecution and the judiciary. MUSAWA has looked into the illegality of the formation since 2016, and we have received complaints from citizens whose legal and constitutional rights were violated by the Supreme Security Committee. MUSAWA has also monitored, documented, and addressed these violations. In light of the inability of the competent official bodies to dissolve this Committee due to its illegitimacy and illegality, MUSAWA shed light on the risks involved in the Committee's work and called for its dissolution at the Seventh Public Prosecution Conference in 2017. In addition, MUSAWA issued statements and position papers in this regard, and we raised discussion among civic coalitions as well as in the media on the gravity of continuing to have this Committee. 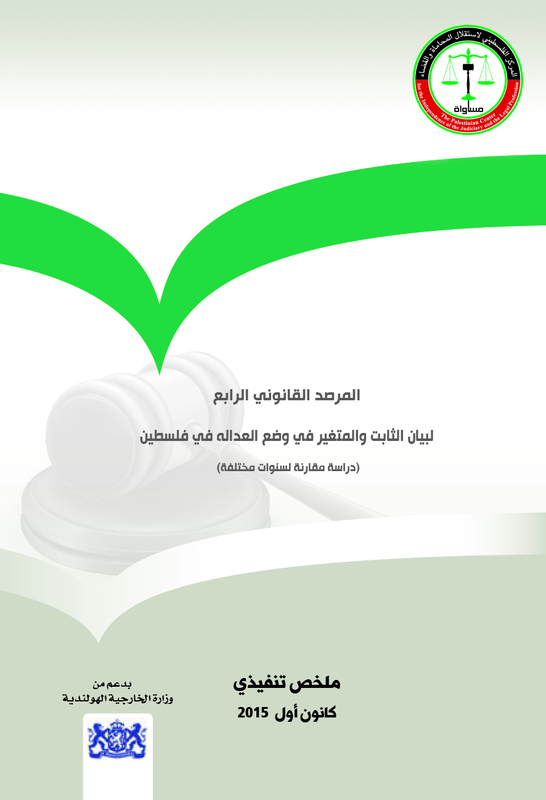 Following the arrest of a lawyer from the Nablus Magistrate Court in late 2017, the range of supporters and those who call for the dissolution of the Supreme Security Committee expanded to include among other actors the Palestinian Bar Association. Despite its official announcement, we note that the decision to dissolve the Committee has not been implemented on the ground until the moment, and we express concerns that the Committee will continue to exist but with a different name instead. Accordingly, MUSAWA calls on the CSOs, human rights activists, and those concerned with the rule of law to stay wide awake, making sure that the dissolution decision would not be replaced with a mere changing of name, from the Supreme Security Committee into “Security Monitoring Committee” for example.